The popular connected running challenge is back! GearSwitch pushes you a tad bit more in 100 days. 100 Days Challenge - GearSwitch, the UP-SIZED version of the popular connected running challenge in ASEAN. Whether on trail or on road, if you have the spirit, just get out and run. You can either challenge it alone, or make it fun with friends as long as you break 150 km in 100 days. Wonder How Far You Can Run in 100 Days? It is not a matter of speed, but instead dedication, determination and a promise to yourself. 150 km or more, you have 100 days to achieve this goal and claim the exclusive reward. 150 km might seem like a mission impossible to some. But don't forget, you have 100 Days too. Elite ultra runners can complete 150 km in a day. If you think 150 km is a piece of cake, you can always do more to inspire others. Going the extra mile is definitely something winners do. Remember, the goal of 100 Days Challenge is to encourage people to run more and run often. If you can run 150 km in 10 days, Congratulations! But don't stop there! Keep running and let's see how far you can go in 100 days. Completing the first run is undoubtedly something worth celebrating. However, let's not miss out on the long term goal of running. For some, this might be to beat their personal best, or to run their first ever marathon, or simply to start a healthy lifestyle. Achieving a long term goal is not an easy task. It requires patience, perseverance and determination. 100 Days Challenge isn't just another challenge. It is one that pushes you past your boundaries, promoting consistent running for overall health and performance improvement. You are given 100 Days to reach the 150 km mark, But you shouldn't stop there. Go as far as you can and mark your own finishing line. Nothing beats peers motivation! Form a team/group with your friends and your team will be entitled to receive the "Hall of Fame" Group Medal when each of you complete the challenge! The medal will have your team name, total combined mileage and individual mileage engraved on the wooden medal. Get 5 friends and form a team!! Shipping fee is included in the participation fee to any mailing address in the ASEAN countries - Brunei, Cambodia, Indonesia, Laos, Malaysia, Myanmar, Philippines, Singapore, Thailand and Vietnam. For international shipment outside of the ASEAN countries listed above, kindly contact us via Messenger m.me/getBiiB for MYR10 ~ MYR35 shipping fee top-up. Your reward and medal will reach your doorstep within 45 days after the event ends. For group/team challengers, all rewards and medals for the team members will be bundled into one (1) single package and sent to the member who created the team. Please contact us via our Facebook page or [email protected] if you want to duplicate "The Hall of Fame" Group Medal. Additional charges will be applied. Q4: I am not living in any of the ASEAN countries. Can I still join the challenge? A4: Yes, absolutely! You can run anywhere you like. In order to get your reward shipped to non-ASEAN countries, kindly contact us via Messenger m.me/getBiiB for the shipping fee top-up. If you have a mailing address in ASEAN, you won't need to pay extra for the shipment. Q5: Can I ship the reward outside of ASEAN? A5: Yes, of course. Kindly contact us via Messenger m.me/getBiiB for the shipping fee top-up. Q6: When can I receive the reward? A6: The reward will reach your doorstep within 45 days after the event ends. 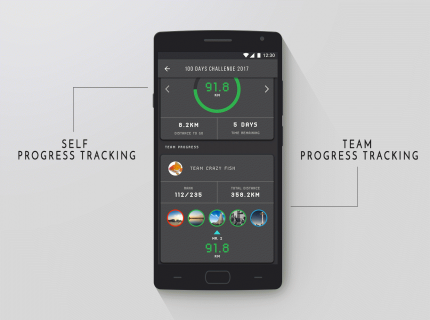 Q7: Can I use other third-party run tracking apps for this challenge? A7: Yes you can. Make sure you submit the screenshots to us via getBiiB.com/me for timely updates. We strongly recommend BiiB+ app to make this challenge fun and hassle-free!